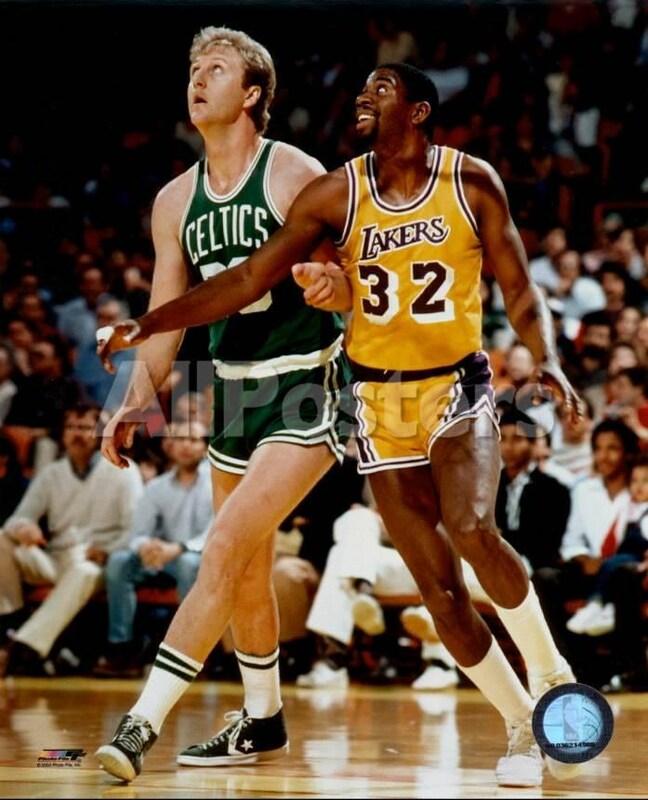 In the 1980’s Ervin “Magic” Johnson revolutionized the point guard position and introduced the NBA to a flashy brand of “Showtime” basketball the likes of which nobody had ever seen. 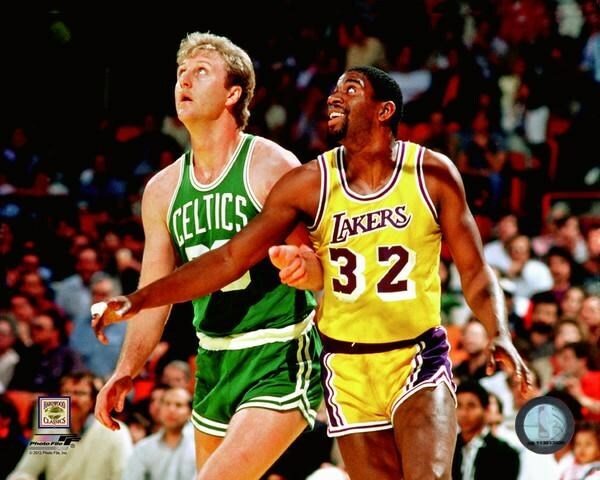 His many battles with Larry Bird, which first took center stage in the 1979 NCAA Championship, intensified in the pros when Magic’s Lakers squared off against Bird’s Boston Celtics, rejuvenating the NBA’s most storied rivalry. 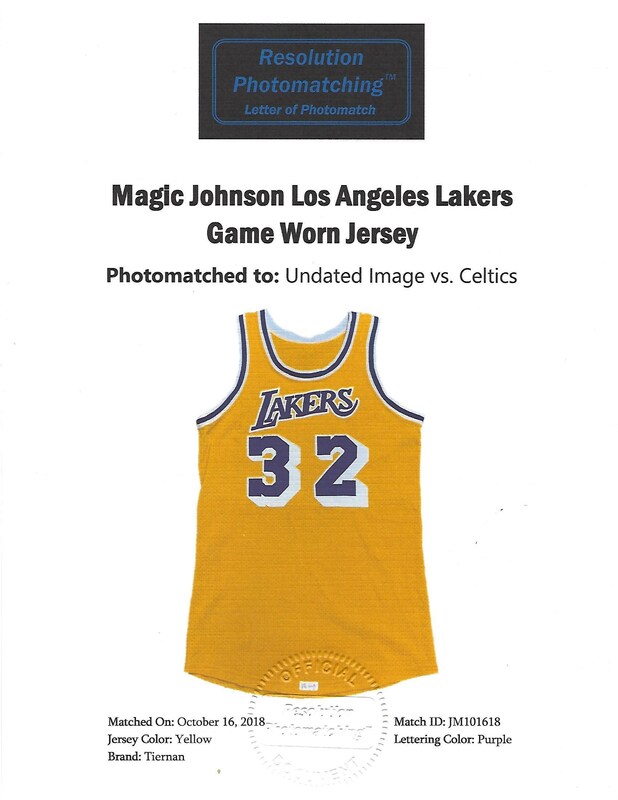 Presented here is the Lakers home jersey Magic wore against Bird and the Celtics that has been professionally photo-matched to a February 17, 1985, regular-season clash at The Fabulous Forum in which Magic went off for 37 points and 13 assists in a 117-111 victory. The image (Getty 1737696) used by the experts at Resolution Photomatching to establish the conclusive match (based on mesh hole alignment with numbers and letters) is one of the more popular shots ever taken of the two hardcourt legends – Magic boxing out Bird in the key as they track a shot attempt – and has been licensed for commercial use countless times. The result of the game was a precursor of things to come in The Finals that June as Magic and the Lakers defeated the Celtics to claim their third of five NBA titles that decade. 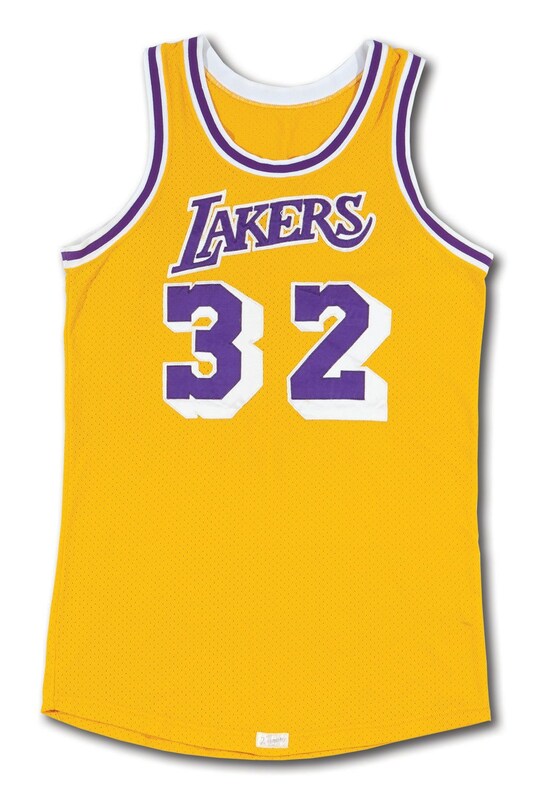 The gold Lakers jersey has proper tagging and shows evenly distributed wear throughout. 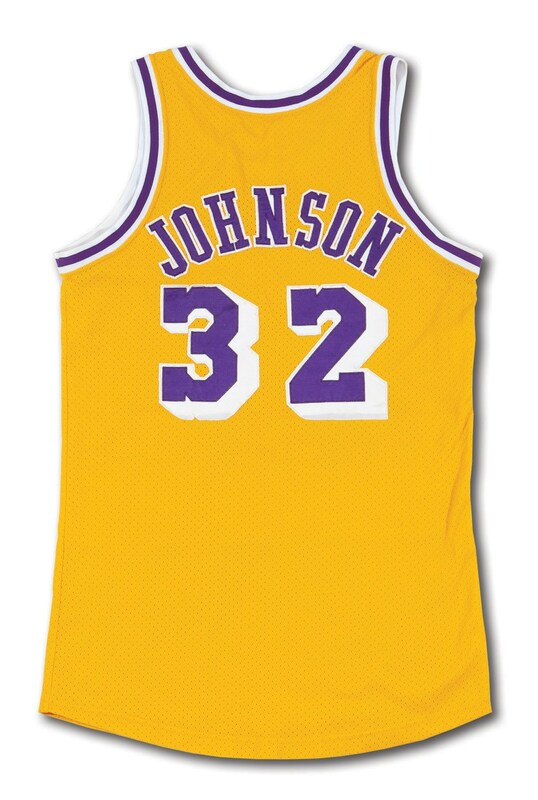 "Lakers" across the front as well as Johnson's trademark uniform number "32”; back reads "JOHNSON" in semi-circular fashion across the shoulders with "32" below. 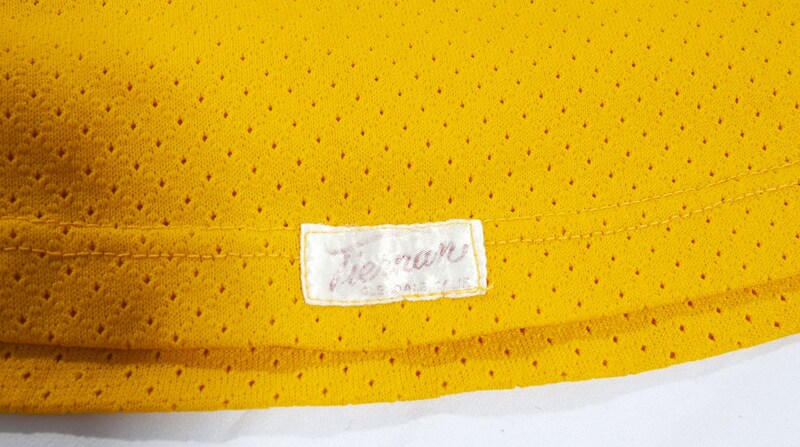 Front center tail has well-laundered/faded "Tiernan - Glendale, Calif. " manufacturer's label found on Lakers jerseys during Johnson's first seven NBA seasons. All-original numbering and lettering done in purple on white tackle twill sewn directly onto the mesh material. The jersey comes with outstanding provenance from a longtime Hollywood agent who wishes to remain anonymous. It should be noted that in January 2017 we auctioned an early 80’s Magic road gamer from the same collection for $47,188; it was MEARS A10 graded but not photo-matched like this one. 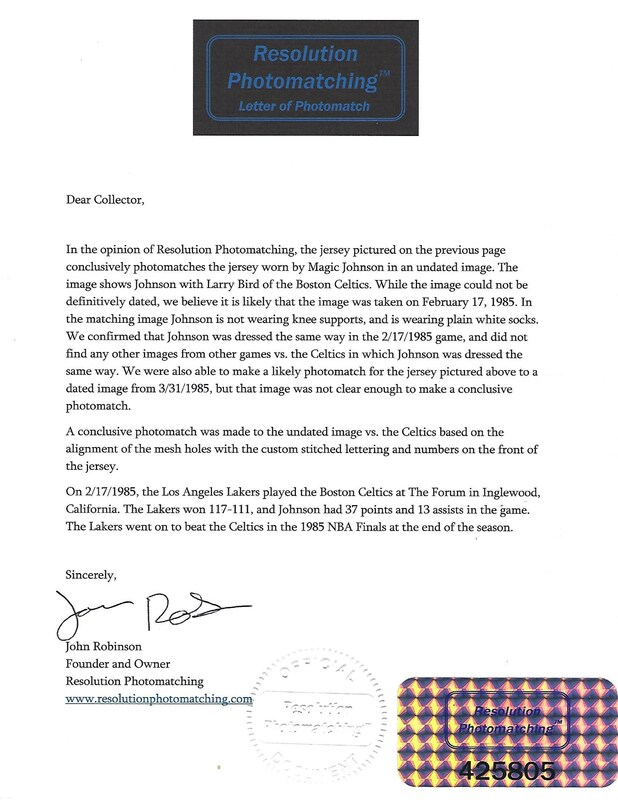 LOA from Resolution Photomatching, which also attributes a “likely” match to 3/31/1985 vs. Phoenix later in the season.